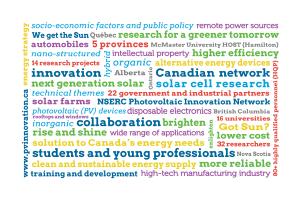 In comparison to other countries, Canada has relatively few researchers in photovoltaics (PV); the NSERC Photovoltaic Innovation Network is needed to enhance collaborations, share resources, and provide training to create a critical mass for PV research within Canada. The main goal of the Network is to help forge a research community in photovoltaics, by encouraging collaboration and communication between researchers and providing enhanced training opportunities for students and young professionals – referred to as highly qualified personnel (HQP). The Network also includes positive engagement with industry to develop HQP and to facilitate technology transfer where appropriate. The NSERC Photovoltaic Innovation Network is a partnership between NSERC, university professors, and industry partners across Canada, focused on the development of novel, cost-effective photovoltaic technologies. In the value chain, the Network focuses exclusively on research at the level of the photovoltaic (or solar) cell, which is the key element in the conversion of solar energy to usable electricity. The technical objectives of the Network are the development of lower cost, higher efficiency and more reliable Photovoltaic (PV) devices. Our research will lead to the development of solar cells that are suitable for a wide range of applications, including solar farms, remote power sources, rooftops and windows, automobiles and disposable electronics. Take a look around our website to learn more about our research, people, facilities and equipment, and explore ways to interact and work together with the brightest minds in Canadian photovoltaic research.